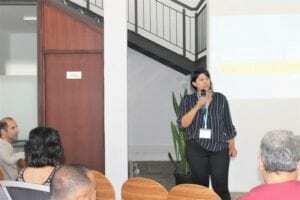 Turbine proudly hosted the Digital for change summit which was organized by the Digital Marketing Mauritius. This event had for purpose to share knowledge on digital transformation, promote the creation of a network of digital marketers and encourage entrepreneurs and individuals as well to make the best use of digitalization. 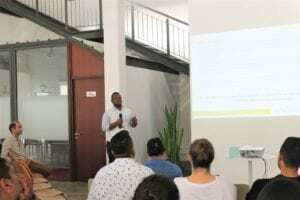 The Digital Marketing Mauritius was launched in 2017 by Jason Bholanauth and joined later by Madevi Subramanian, Dylen Citta, Jemilla Greedharry, and Pahlavi Tilloo. This group of dynamic digital marketers started with the vision to provide a platform of knowledge sharing and learning about Digital Marketing since this field is still new and vast, constantly changing and interesting. The event was well received by the audience, there were a total of 184 registrations. We were honored to have 3 inspiring speakers who shared with us their experiences. Natacha Emilien, the Co-founder and Managing Director of Red Dot, shared with us how in her quest of satisfaction and self fulfillment. She changed her career path from engineering to accounting. After 13 years as an employee, she is now an entrepreneur who is much more happy, with the feeling of being free and having a bigger purpose. She encouraged the audience to go forward and try things, the first choice may not be the right one though the experience is worth it. Chen Hindi, General Manager and Head of digital at Quantum, explained how the various tools of digital marketing can be exploited for more concrete information and thus better strategic decisions. She also believes that despite the lesser response rate, email marketing retains people who are genuinely interested and give their undivided attention to the mail while they read. Chen gave some foolproof examples of companies who are successful through digital marketing. Sean Fourmacou, Founder of YouthSceal, brought another aspect of digital marketing: a platform to sensitize people and address social issues. He explained that social media allowed him to reach the mass population whereby his messages were heard, seen through videos and people could connect and engage. Sean learnt how to make use of digital marketing to meet his purpose. He showed the various actions that have been done by YouthSceal which were very impressive. Sean also encouraged the audience to make best use of digital marketing so as to connect people and get things done for a better society. The feedback that this event received was very positive. each person who attended this event learnt at least 3 new things. The dynamic interaction that followed between the speakers and the audience after each presentation showed the intensity and success of the event. Follow Digital Marketing Mauritius on Facebook and stay tuned for their next event.